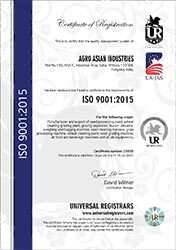 Catering to the needs of agricultural machine industry, we, Agro Asian Industries, have emerged as one of the leading ISO 9001:2008 certified manufacturers, exporters and suppliers. Our company was founded two years back in 2013 and since then we are continuously climbing the success ladder. The success that we have attained today in this industry is because we offer an impeccable range of Wheat Grading Machine, Grain Processing Machine, Spices Grading Plant Pre Cleaner, Seed Processing Plant, Wheat Cleaning Plant and many such items. These agro or food processing machinery have been developed as per the recent techniques so that they give productive outputs. Moreover, the hi-end performance, efficient working, long working life, easy to maintain and use and other such attributes of our products are greatly appreciated in the market by our customers. To gain the trust and satisfaction of our customers we always believe in following fair business ethics.